As mentioned in our relevant Parks page, this is public space is of local historical importance, being the site of a palace for the Bishop of Rochester for many centuries. It is also the location of number of listed structures. See our relevant Parks page for details. While it is now a public space, sadly underused by the public, parts of the Civic Centre site are now earmarked for commercial development in the council’s Bromley Town Area Action Plan (BTAAP) and their later Local Plan. The latter proposes large parts of this site be used for mixed development of housing and a school. The BTAAP was published, initially in 2006, can be viewed in several parts on the council website. The relevant part can be downloaded here. 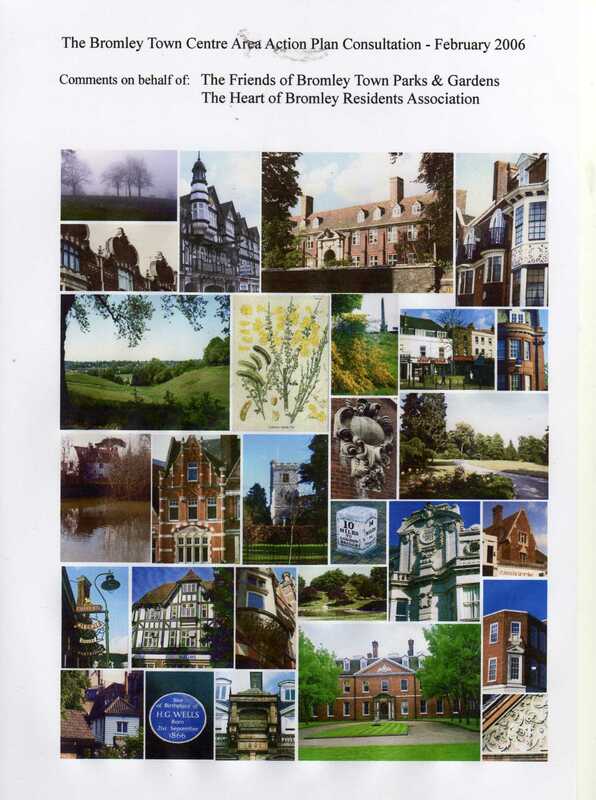 Our Friends group, along with HOBRA (now Bromley Civic Society), produced a response to this plan again in 2006. This is park was identified as Opportunity Site F on page 77 of this document. They identified the following opportunities. • Redevelopment of existing civic office floorspace and associated functions. As the council outsources its services and reduces its staff their office space has been concentrated in a few buildings on site. • A 5,000 sq m new leisure facility to replace The Pavilion (subject to and in advance of, the redevelopment of Site E). With their intention to redevelop the current Pavilion site for retail they propose to rebuild this sports facility onto a smaller site off Stockwell Close, presently being used as for activities as well as the Great Hall. • A low density residential development of about 20 units. Until recently these two buildings, built as student accommodation when a teachers training college, were council staff offices. Now empty they would be demolished and replaced by high-end housing. It is our concern that with these extensive developments access to the park will be restricted, particularly from Rafford Way, as this public space is mainly exploited for the benefit of the few! The impact on the park, especially during construction works are also of concern.